Egyptian President Mohammed Morsi on Sunday stunned the region and caused grave concern in Israel when he dismissed all of Egypt’s top generals and installed commanders loyal and subservient to his Muslim Brotherhood. Following the ouster of former dictator Hosni Mubarak, the Supreme Council of the Armed Forces headed by former Defense Minister Field Marshal Mohammed Hussein Tantawi had held de facto power, and had placed certain limitations on the presidency when it became clear the Muslim Brotherhood would the election. For instance, the Tantawi-led council had introduced a constitutional amendment that forbade the president from declaring war without the council’s approval. In addition to firing Tantawi, the Egyptian chief-of-staff, and the heads of the navy and air force, Morsi also rescinded all of the council’s constitutional amendments, effectively granting his office outright control of military matters. So long as Tantawi and the other older generals were largely in control of military matters, Israeli leaders were more or less certain that Egypt’s revolution would not lead to armed conflict with the Jewish state. But with the Muslim Brotherhood seizing control of the armed forces, previous assessments are now void. Israeli commentators said they do not expect a sudden “call to arms” in Egypt, but are concerned that the Muslim Brotherhood-appointed generals will not cooperate with Israel like the old generals did. That will ultimately result in a situation similar to Lebanon, where Israel is forced to act on its own in foreign territory to stop terrorist threats. And the Egyptian Sinai is fast becoming a regional hotspot of terrorist activity, making it all but inevitable that Israel would have to launch military incursions should Morsi’s forces stop preventing attacks on the Jewish state. On the other hand, only last week, Israel approved a temporary amendment to the Camp David Accords to allow Egypt to deploy more forces to Sinai to root out local terrorist gangs. There is now concern that Morsi will not pull those forces back once their mission is complete. Sultan operates an Islamic teaching center in the American state of Ohio. Speaking of America, the Washington Post reported that the Obama Administration is not at all concerned by Morsi seizing control of the military, and that it has “confidence” in the newly installed generals. Suspected members of the global jihad movement, in which Al Qaeda plays a leading role, attempted a bold infiltration of southern Israel Sunday night that left 16 Egyptian soldiers dead. The terrorist cell started by attacking an Egyptian army post at the point where the Egyptian, Israeli and Gaza borders meet. Not far from that point is the Israeli kibbutz of Kerem Shalom, which is believed to have been the intended final target of the assault. As the terrorists entered the Egyptian post, they detonated suicide bombs and opened fire on Egyptian troops before taking control of two armored personnel carriers and making a run for the Israeli border. The Israeli Air Force destroyed one of the vehicles as it crossed the border into southern Israel. The second vehicle never made it that far, after presumably being disabled by Egyptian forces. Israeli officials said they had intelligence on a possible cross-border attack and had already put their forces on alert. The attack came just days after Jerusalem warned all Israeli travelers to immediately leave the Egyptian Sinai, which has become a hotbed of jihadist activity in recent years. Apparently acting on the Israeli intelligence, the US issued a similar warning to American tourists in Sinai. The events in Sinai prompted Egyptian President Mohammed Morsi to publicly vow to reestablish firm Egyptian authority over the territory. On Monday morning Egyptian media reported that government forces had “laid siege” to the Sinai-Gaza border town of Rafah, where the perpetrators of the attack were believed to be hiding. Israeli Ambassador to the US Michael Oren linked the attack to Iran, stating in a Twitter post that “the thwarted attack underscores the lengths to which the extremist regime in Iran will go to kill innocent Israelis.” Other Israeli officials said they expect more cross-border attacks of an even more ambitious nature. Meanwhile, Palestinian terrorists operating out of the Gaza Strip took advantage of the situation to launch their own assault on southern Israel by raining down dozens of mortar shells on local communities and opening fire on Israeli border patrols. Israelis residents living in the area were instructed to spend the night in their bomb shelters as the IDF engaged in a lengthly exchange of fire with the terrorists. No injuries were reported. 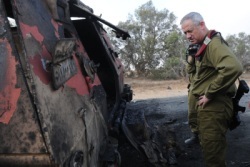 * Photo: IDF Chief of Staff Maj.-Gen. Benny Gantz examines the burned-out shell of an Egyptian armored carrier used to break through Israel’s border fence. The inauguration of Muhammad Morsi in Egypt prompted a quick Israeli response: The Prime Minister rushed to congratulate the newly elected president, expressing hope that the two countries will continue to cooperate on various levels; in Cairo, Israel’s ambassador to Egypt, Yaakov Amitai, met with several top-ranking members of the Muslim Brotherhood, stressing that Jerusalem had no intention to interfere with Egypt’s domestic affairs. This, however, masked the deep anxieties of the country’s leaders. As the flames of revolution are still raging at Israel’s doorstep, many experts voice their concerns about the impact of those events on the Jewish state. “Israel will be facing challenges in several spheres,” said Orit Perlov, a researcher who focuses on the Arab states at the Institute of National Security Studies (INSS). “Since the epicenter of the uprisings is usually the capital or the country’s major cities, the periphery is left neglected, creating a void that is easily filled by various terrorist cells,” she continued. Indeed, after the eruption of the popular protests that toppled the regime of Hosni Mubarak, Egypt’s Sinai Peninsula turned into a haven for terrorist activity. In May, for example, Egyptian security forces intercepted three trucks carrying more than 40 surface-to-surface missiles, 17 rocket-propelled grenades, several mortar shell launchers, seven assault rifles with 10,000 rounds of ammunition, and surveillance equipment. Other reports indicated that Jihad Islami, a terrorist organization aimed at annihilating Israel, was establishing arms-making and logistical bases in the area, convinced that the long arm of Israel’s Defence Force (IDF) wouldn’t reach them there. Some militants went as far as stationing long-range rockets in the region (some of which have already been fired into Israel), assuming that Jerusalem would be far less inclined to attack such sites out of concern for bilateral ties with Egypt. Others – reportedly linked to Al-Qaeda – made several attempts to infiltrate the country. Sinai’s native population – the Bedouin tribes that comprise about 300,000 people out of the local population of 430,000 – add fuel to the fire by smuggling arms, drugs, prostitutes, and African migrants into Israel. They have also been accused of attacking Egypt’s gas pipelines pumping energy into the Jewish state (meeting some 40% of the country’s domestic demand). All of these developments have been particularly frustrating, given the fact that in the past 30 years the 240km Israel-Sinai border remained mostly unprotected, saving both countries tens of billions of dollars in military expenditures. The situation wasn’t ideal under Mubarak though, but the strong fist of the security forces presented a deterrent to those, willing to undermine stability. Now with the regime gone, many terror groups feel free to dictate their own rules. Addressing the issue — especially following last August’s terrorist attack that left eight Israelis dead and some 31 others wounded — Israel decided to construct a sophisticated fence (at a considerable cost) along the entire border. The move did decrease trafficking and illegal immigration but failed to solve the problem of militants shooting into Israel, leading the IDF to beef up its presence in the area. But apart from the high level of violence that’s been plaguing the area, Perlov said Israel would face other challenges. “An excessive flow of unsupervised weapons is streaming from Iran via Sudan, Libya and the Gaza Strip, while the populist government in Cairo lacks any basic policy to tackle the problem,” she told Israel Today. “This kind of situation bogs down the country’s economic development, which needs stability,” she stressed. 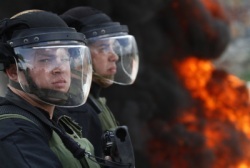 However, some Israeli politicians remain optimistic about the future of Egypt. Defense Minister Ehud Barak said Egypt would probably move towards a Turkish version of Islamic democracy, meaning Cairo would maintain a ‘cold peace’ with Jerusalem. But as tensions escalate across the border, Israel might opt for retaliation, leading to a full-fledged war. Nevertheless, Perlov said that such a development was highly unlikely. “Egypt cannot afford a military conflict with Israel,” she reasoned. “The country’s government recognizes our superiority in this respect. Besides, they have enough headaches to cope with, including high unemployment, the ailing economy, religious and sectarian strife – to name the major issues,” she concluded. On eve of sixth anniversary of Second Lebanon War, Galilee Division commander Brig. Gen. Herzi Halevi says Israel is prepared for war with Hezbollah, and with the Lebanese army if necessary • Border clash narrowly avoided after Lebanese soldiers mark IDF soldiers as targets. With Israel about to mark six years since the Second Lebanon War next week, senior military officials have warned that if Israel is provoked, the next round of fighting with Lebanon will more destructive than the last. The commander said the IDF was prepared and ready for any scenario on the northern border, including a war against Hezbollah and, if necessary, the Lebanese army. 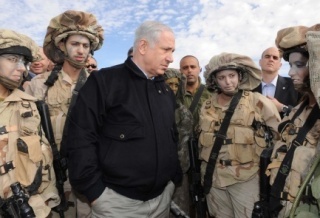 Other Israeli military officers have also expressed concern about an increase in tensions between Israel and Lebanon following an incident on the border last week when a full-blown confrontation with the Lebanese army was narrowly avoided. Last week, Israeli soldiers patrolling the area noticed that Lebanese troops across the border were aiming their weapons at them. 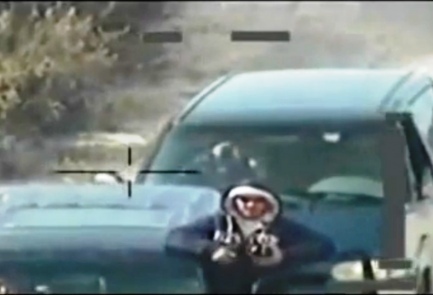 One of the soldiers overheard the Lebanese commander describing the Israelis as targets. The Israeli soldiers quickly summoned a backup force, and, with the arrival of tanks at the scene, the Lebanese forces withdrew. 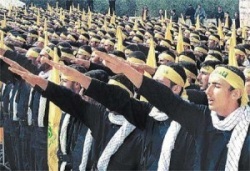 Halevi also revealed that the IDF was aware of Hezbollah’s reconnaissance activities on the border. Hezbollah continues to collect information on Israel through observation stations located in residential buildings, patrol vehicles, and dozens of operatives on the field. The IDF Spokesperson’s Unit released a video documenting Hezbollah’s intelligence collection vehicles on the northern border. Meanwhile, on Thursday, an official ceremony was held at Mount Herzl cemetery in Jerusalem to commemorate soldiers who lost their lives in the Second Lebanon War. The ceremony was attended by IDF Chief of General Staff Lt. Gen. Benny Gantz, former IDF head Lt. Gen. (res.) Dan Halutz and Minister Without Portfolio Yossi Peled. “The Second Lebanon War was necessary for Israel to restore its deterrent capability,” Peled said at the ceremony.